How far would you go to protect your way of life? For rural homesteaders Ellen and Elise Gerhart, you trade a quiet retirement for jail time, camp out in a tree as chainsaws growl around you, and come under surveillance from drones. If you’re attorney Michael Bomstein, you spend a sunny Sunday in your office preparing a case pro bono, even though it’s a long shot. If you are Eric Friedman, you spend all your spare time attending meetings, collecting documents, and talking to reporters and government leaders. And if you’re Allison Chabot, a clinical psychologist with two young children, you get ready to sell your home and move away. All of these people live near the path of Sunoco Logistics’ massive Mariner East 2 pipeline (ME2) project now under construction across Pennsylvania’s southern belt to bring fracking gas to Scotland. Spanning 350 miles, by 2018 the $3 billion twin ME2 pipelines plus an existing ME1 pipeline are slated to bring 345,000 barrels per day of ethane, propane, and butane – classified as “hazardous liquids” by the US Department of Transportation – from the Marcellus Shale region across 17 counties to a storage facility at Sunoco’s Marcus Hook Industrial Complex. From there, the ethane will set sail for the Ineos petrochemical complex at Grangemouth on “dragon ships” to build the company’s proposed plastics empire. In the first part of a major US fracking investigation funded by the digital campaign group, 38 Degrees, The Ferret reported in May that eyes teared up with fear and sadness in the western part of Pennsylvania. But farther east in Huntingdon County and the Philadelphia suburbs, jaws are set in anger. Campaigners say their basic rights are being trampled – no small thing in the state where the US Constitution was born – and they are fighting to halt this pipeline and others like it. Or at least, to win the safeguards to which they believe they’re entitled. For while excavation and pipe laying proceeds apace, the ME2 is not really a done deal. Barriers include multiple lawsuits, three of which are making regular headlines as the pipeline’s owner and campaigners chase the cases up the courtroom ladder. Whoever prevails in this David vs. Goliath battle, Scotland should watch with interest as its politicians weigh whether to permanently ban fracking. In 2012, Sunoco Logistics signed a deal with the petrochemical giant Ineos to deliver ethane to Scotland. 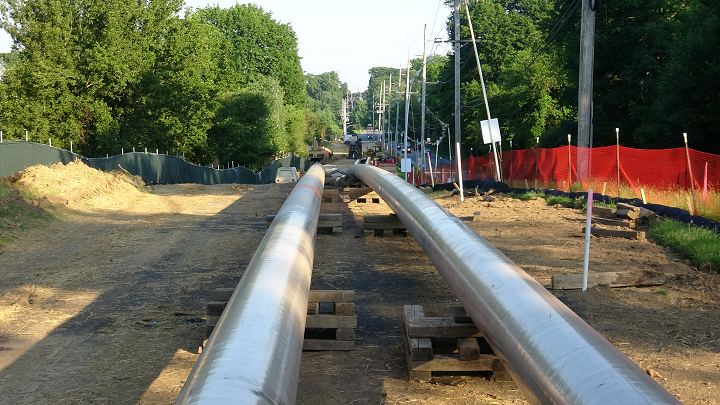 As part of its decision to build pipelines to bring the glut of so-called natural gas liquids (NGLs) in Pennsylvania to market, it created the Mariner East 1 (ME1) pipeline, retrofitting an 8-inch oil pipeline constructed in the 1930s to carry NGLs. It also reversed the pipeline’s flow from east-to-west. Instead of flowing towards in-state customers through then-sparsely populated areas, it now flows west-to-east towards the urban port of Philadelphia. The company conceived the two additional pipelines of the Mariner East 2 (ME2) as extensions of this project, and proceeded on the assumption that it should be “grandfathered in”. Designed to run somewhat parallel to the path of the ME1, the new pipelines will snake through farms and forests, cut across wetlands, streams, and lakes, run beside busy roadways, across town centres, and alongside homes and schools in Philadelphia’s densely populated western suburbs, including “high consequence areas” with vulnerable people in schools and nursing homes. The product it will carry to market is not conventional natural gas or methane but a combination of gas byproducts: ethane, propane, and butane, most often used in manufacturing. These compounds will be transmitted through the pipeline at up to 1,500 psi of pressure. Categorised by the federal Pipeline and Hazardous Materials Safety Administration as highly volatile liquids (HVLs) they are extremely flammable and explosive. In the event of a leak, the pipeline’s contents would become gas again. Unlike methane, the gases are heavier than air. They would descend to the lowest point on land, forming an invisible, smothering cloud that could be ignited by something as simple as turning on a cell phone or flipping a light switch. It also ranks third-party interference, rather than operator failure, as the number-one cause of accidental gas releases. In February 2017, Pennsylvania’s Department of Environmental Protection (DEP) flipped a bureaucratic switch expected to reverberate in Scotland by the end of the year. Ineos partner Sunoco Logistics, now part of Energy Transfer Partners (ETP), received the soil erosion and water crossing permits it needed to officially begin construction of the ME2 pipeline. It had taken a year and a half of submissions and resubmissions by the company to correct scores of issues and deficiencies found by DEP and raised by some 30,000 public comments. Even now details on how the company planned to protect the environment, drinking water sources, and historic sites remained unanswered. Preparations for the pipeline were already well underway. Since 2015 the company has been buying up legal rights, known as easements, to use public and private property for the pipeline. In June 2017, the Southeastern Pennsylvania Transportation Authority granted easements along its commuter train routes in a $1.6 million deal. But unlike with offers to lease land for fracking, which can be declined, those who refuse cooperate with the company have had portions of their property seized via a legal manoeuvre called “eminent domain”. This privilege is usually reserved for governments rather than private companies. But Sunoco has been able to exploit eminent domain because, in a controversial 2016 decision, judges ruled that the company is a “public utility” whose pipeline serves the collective good. To 30-year-old Elise Gerhart, though, Sunoco and ETP are “terrorists,” and the pipeline is “a bomb” they placed at her family’s doorstep. She and her parents Ellen, 62, a recently retired teacher and Stephen, 86, reside outside Huntingdon, Pennsylvania. The community is about halfway between Pittsburgh and Philadelphia and in 2009 was voted one of the “coolest small towns” in America by Budget Travel magazine. For 35 years, the Gerharts have lived there amid 27 wooded acres filled with peace, quiet, and wildlife including painted turtles and a protected species of bat. Today, however, three of those forested acres, hosting ponds, streams, and wetlands conserved through the state’s forest stewardship programme, have been denuded for the Mariner East 2 pipeline right of way. The Gerharts are considered trespassers on their own property. Back in early 2016, that three-acre parcel was “condemned” after they refused to sell Sunoco an easement. It could have ended there, but the family has resisted. So far, the company has prevailed, winning an injunction in March 2016 that prevented the Gerharts from interfering with work on the pipeline. Then things escalated. On 29 March 2016, a large work crew bearing chainsaws, accompanied by a gaggle of state police officers, showed up to clear-cut a swath of trees and survey the area. Elise and three allies were waiting on platforms high in the trees to bear witness; 12 other protesters stood nearby. Workers began felling trees all around them. According to Ellen, whose great-grandfather emigrated from Scotland, she tried to warn authorities Elise was in danger from falling timber. Instead, they arrested Ellen. About a week later, work crews showed up again. When Ellen went to talk to them, she was arrested again. This time, she was sent to a county prison for three days and placed into solitary confinement after she refused to answer a corrections officer’s questions. She told The Ferret: “I was placed on suicide watch … so I decided to go on a hunger strike.” She was not allowed to call her family or a lawyer for two days, she says. Eight months later, charges were dropped. “[That land] is still on our deed, and we still pay taxes on it,” said Elise. “All of a sudden, just because Energy Transfer Partners wants to think that they own it, we are being made into criminals for doing things that aren’t actually crimes.” They say they still haven’t been paid for the right to use their land, as required by law. Today, Ellen and Elise are full-time, unpaid anti-pipeline activists, hosting an encampment dubbed Camp White Pine in emulation of the now-dismantled Standing Rock encampment in North Dakota. Campaigners congregate among the still-standing trees. 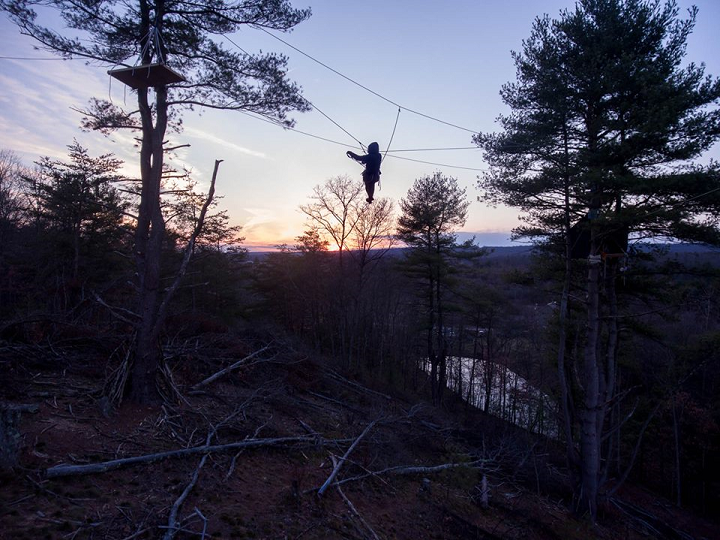 They sleep on tarpauline-covered platforms and prepare meals in a makeshift outdoor kitchen, zooming on zip lines strung between the pines to hang protest banners. Now famous across Pennsylvania and beyond, the camp has become a thorn in Sunoco’s side. So far, the workers haven’t ventured back, though pipeline activity proceeds all around the neighbourhood. But the company wants to resume construction. In April 2017, it obtained a so-called writ of possession, a rarely used mechanism that forbids the Gerharts and their supporters from entering the seized land, or face arrest. And they are being watched. Strange craft, including drones and low-flying helicopters, have been seen hovering overhead. According to an investigation by The Intercept, ETP has a history of using military-style tactics on anti-pipeline campaigners. 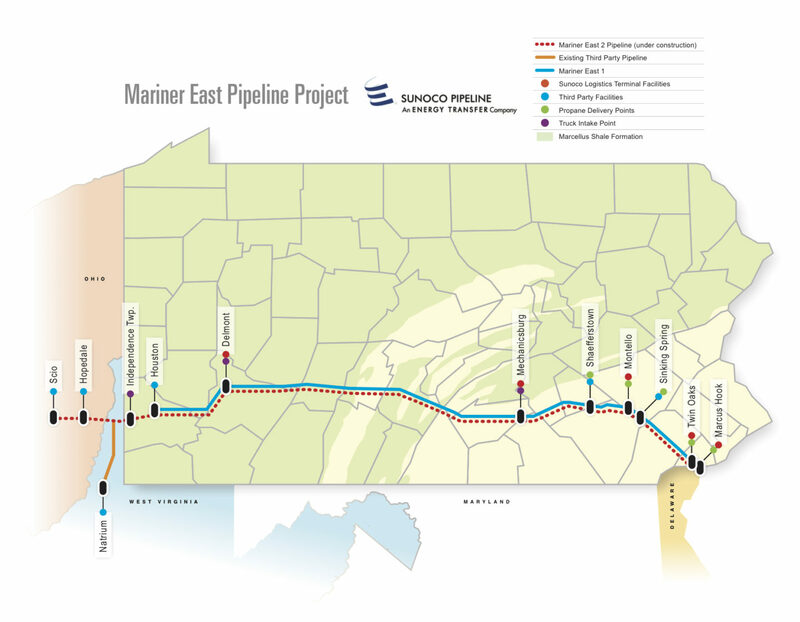 The Intercept also revealed that internal documents from the private security firm Tiger Swan “suggest the company has had a presence in Pennsylvania since at least April,” designed to muffle opposition to the Mariner East 2 pipeline. On 27 June, the Gerharts and Sunoco met in county court again over the injunction that criminalises their presence at the work site. The Gerharts hoped a landmark ruling by the state Supreme Court placing the state constitution’s environmental rights amendment on par with other amendments would sway the judge in their favour. It didn’t. While Ellen and Elise and their supporters have been defending their land, environmentalists and citizens groups have been responding at the municipal and statewide levels. Some of them are further east along the proposed path of the pipeline, in the Philadelphia suburbs of Delaware and Chester counties. In this region of quiet and attractive downtowns and spacious but close-set houses, anti-pipeline pickets assembled in front of government buildings have become a common sight. Unlike in western Pennsylvania, where the prospect of a gas-leasing bonanza or construction jobs breeds local support for fracking, in Middletown Township and surrounding communities many people are already employed in well-paying professions. They’re concerned that a pipeline almost literally in their backyards will reduce the value of their homes. But they say the main reason they don’t want energy infrastructure is that they fear for their lives. Here, the words “blast zone” are on everyone’s lips. That fear has led them to leverage “home rule,” the broad powers of self-determination Pennsylvania grants its municipalities. So far, eight towns have sent official proclamations like this one to state leaders, outlining their concerns about the Mariner East pipelines’ dangers and urging more oversight and public input. Residents of several towns in the area have been suing Sunoco on the grounds that it violates local zoning ordinances. If the pipelines must come, they say, let them be re-routed. Citizens of West Goshen, for example, filed suit against Sunoco in May, arguing that the pipeline is a hazardous industrial use that has no place in a residential zone. 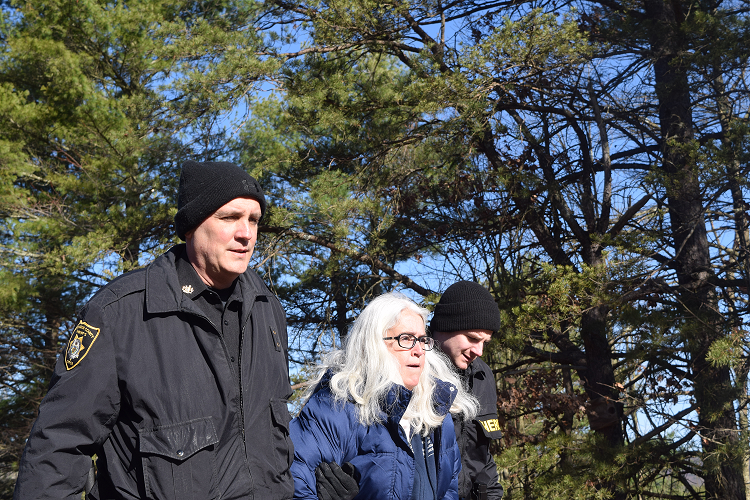 In Middletown Township, four apartment dwellers and two homeowners took the company to court because the pipeline will run less than 75 feet from their homes, in violation of a longstanding code. The group, dubbed the “Middletown Six,” retained attorney Michael Bomstein, who shared Alison Higgins’s story with The Ferret. Standing on a bright-green patch of lawn and squinting into the late-afternoon sunlight, Michael, mustachioed and soft-spoken, gestured to mark out the parameters of the pipeline right of way and the position of the pipes relative to Alison’s modest white house. From where he stood, children could be seen across the street playing in a kiddie pool. Speaking as if in a courtroom, he pointed out that pipelines would run between 10 and 20 feet from Alison’s and her neighbour’s homes. “We think that’s very significant as a moral matter and as a matter of public safety,” he said. Michael can empathise with his clients. An earlier version of Sunoco’s plans sited the pipeline across his own yard, just blocks away. The case was heard 23 June, but the judge ruled in favour of Sunoco. Michael says the group will likely appeal. Alison Higgins, a housewife and grandmother who raised four children in the home, told The Ferret she felt odd celebrating America’s Independence Day on 4 July. If Delaware County is the centre of anti-pipeline activism in southeastern Pennsylvania, the Middletown Coalition for Community Safety (MCCS) is its hub. The group of local parents and residents mobilised in August 2016 to educate the public and elected officials about the pipeline’s risks. The local membership, now numbering 3,000, began to grow in September 2016, when the Middletown Council unanimously voted to accept $1.8 million from Sunoco for seven permanent rights of way on public land and roads, despite vocal public opposition. One such site lies 800 feet from the public Glenwood Elementary School. MCCS spokesman Eric Friedman, who works as a safety inspector for the Federal Aviation Administration, lives with his wife and son in the upmarket Andover subdivision in Thornbury Township. His homeowners’ association tried unsuccessfully to block pipeline infrastructure on its property on the grounds it violated a local open-space ordinance. Intense and focused, he seems to work round the clock, facts and figures at the ready, to dispel what he calls myths surrounding the pipelines. To that end, the organisation commissioned an independent county-wide “gas arrival time” assessment. The findings include the possibility of fireballs, “asphyxiations, explosions, and death” within 15 minutes of the gas’s arrival into an area with buildings and people. According to another Glenwood parent, Seth Kovnat, an engineer who has worked for the NASA space program, even a best-case scenario would be devastating. He described what could happen if Sunoco detects a leak in the Mariner’s 20-inch pipe and immediately shuts off the valves. Friedman points to self-reported data from the federal Pipeline Hazard and Materials Safety Administration to argue that a significant accident is likely to happen sooner than later. An independent probability analysis MCCS commissioned from Quest Consultants looked at industry’s track records, especially Sunoco’s. These records show that the company has had an average of two leaks per month from its pipelines over the past 10 years. This is more than all its competitors. Sunoco maintains that the Mariner East 2 pipelines will be state of the art, and points to a technical report by consultants Accufacts. The report was originally commissioned by the town of West Goshen and based on Sunoco-submitted information. It is featured on the company’s pipeline website. Yet in April, there was a leak on the Mariner East 1 pipeline – already bringing ethane to Europe – in Morgantown, Pennsylvania. It was found not by Sunoco’s sophisticated monitoring systems but a local resident. Officials were notified quickly, but the public didn’t hear about it for several days. * On 7 July 2017, ME2 pipeline construction near the town of Exton in Chester County was temporarily suspended after many residents noticed water from their private wells had become contaminated. * In May 2017, drilling slurry was released into a Delaware County waterway on several occasions during ME2 pipeline construction. * In autumn 2016 55,000 gallons of gasoline were spilled into a river after a pipeline rupture in Lycoming County. All told, Sunoco reported 285 pipeline incidents between 2006-2017. One thing MCCS members would like is a transparent and effective evacuation plan in case of accident. Sunoco representatives and presentations have recommended only that those who observe or hear about an accidental release flee on foot at least one-half mile upwind. But it’s unclear what would happen if a release isn’t noticed. According to a 2015 Pipeline Safety Trust briefing paper, some leaks can evade remote detection systems. The community’s children are a special concern. Glenwood Elementary School, which ran a mock emergency drill in May 2017, would seem to be taking preparation seriously. However, according to local resident Allison Chabot, a clinical psychologist whose son and daughter are students there, it was inadequate at best – and at worst, a public relations stunt. Soon. The family’s home is only about 600 feet from the pipeline path, and they reluctantly plan to relocate. Allison said they would like to stay within the district they love but any property they buy must lie beyond the minimum half-mile evacuation zone. The fears underlying the concerns are not all theoretical. Driving around the county on a weekend, signs of impact are jarring well before work has been completed. At the corner of Bow Tree Drive and Eldridge Drive in East Goshen, a set of enormous, silvery steel tubes with openings wide enough for a small child to squeeze in, thrust along the horizon by a busy road and residential developments. There are no “keep out” signs or other forms of security preventing people from walking around the construction site. Near Eric Friedman’s home in Thornbury Township, in the grassy common space a few metres from the wooden fence marking the subdivision, a valve site for Mariner East 1 looks like a target. It’s secured with a metal mesh fence and warning signs. Until recently it was surrounded with flimsy plastic fencing, the valves haphazardly fixed to a stack of wooden boards. A letter of complaint from his home owners’ association’s lawyer lead to the upgrade. The CAU representative did not respond to inquiries about the email. Although these individual and local efforts haven’t borne much fruit, they may have served to further delay the pipeline, which was originally scheduled to be completed in 2016. Larger efforts are under way that campaigners hope can stop the opening of the pipeline so critical to Ineos’s scheme to export gas to Grangemouth. The Clean Air Council (CAC) is a 50-year-old regional environmental group “dedicated to protecting and defending everyone’s right to breathe clean air.” The council has mounted two statewide anti-pipeline lawsuits on behalf of Pennsylvania citizens. It seeks to void Sunoco’s DEP permits, and thus halt construction. CAC’s Alex Bomstein, Michael’s son, is the lead attorney on both suits. “DEP didn’t know fully what it was permitting,” he says. The case is only in the early phase of collecting evidence and depositions. According to Alex, it could take months before an administrative tribunal can hear it. The DEP declined to comment on litigation that was pending. But the CAC’s eminent domain case against Sunoco is moving forward, after a judge rejected Sunoco’s move to dismiss it. It hinges on the idea that the for-profit corporation was misclassified as a public utility, like an electric company or municipal water service, alleging that Sunoco misrepresented the pipeline as primarily an intrastate project, designed to serve Pennsylvanians. This designation allowed the company to use eminent domain to gain property it was otherwise unable to purchase. According to the suit, the pipeline is called Mariner for a reason – because its contents are headed across the Atlantic. The company originally sought federal approval as an interstate pipeline designed to export gas liquids, then “changed its tune,” the suit alleges. It also avers that Sunoco’s ability to take land for the pipeline abridges Pennsylvanians’ rights under both the state and US constitutions. Sunoco declined to comment on pending lawsuits. Industry advocates view the campaigns and suits as attempts to stall the inevitable, and say the pipeline is not just for exports. “The idea that Mariner East 2 doesn’t provide local benefits is demonstrably false,” said Kurt Knaus of Ceisler Media, a spokesman for the Pennsylvania Energy Infrastructure Alliance (PEIA) . He said potential customers for pipeline products include the 190,000 households who use propane for home heating. Knaus noted that Sunoco will be adding three new propane distribution points across the state. He also cited a power plant under construction that will run on a combination of natural gas and ethane – albeit not in the mass quantities to be shipped to Europe. According to business leaders, Ineos, and Pennsylvania’s government, the nearly $3 billion infrastructure project is the best thing to happen to the economy in decades. Supporters point to a glowing report by Econsult Solutions that was commissioned by Sunoco. It predicted that once the Mariner East 2 pipeline is operational, it and the company’s Marcus Hook Industrial Complex will generate $4.2 billion for Pennsylvania’s economy and contribute $62 million in property taxes annually. The study said they will also create over 30,000 direct and indirect jobs and about 300 to 400 permanent positions throughout Pennsylvania. He is thinking big picture. “The state unemployment rate has been high. Jobs have been lost in the energy industry and the skilled trades,” he said. Attorney Alex Bomstein said something was missing from these rosy forecasts. In early March 2017 he cross-examined the author of the Econsult report. He asked what downsides had been considered, and was told none. The report didn’t look at the costs to farmers who had their land left unproductive, the cost to landowners or the tourism industry, he said. As for public safety, supporters point to the US Department of Transportation finding that movement of fuels and hazardous liquids by pipeline is far safer than by truck or rail. They cite the Accufacts study as evidence the Mariner project will be well constructed. PEIA’s Amorós does agree that the hazardous liquids pose unique risks. “This particular pipeline needs to be specially reinforced, operated under stricter safety standards, and if we see that basic standards are not in place we will not even begin digging until those questions are answered to make sure our members are not harmed,” he said. That doesn’t satisfy MCCS’s Eric Friedman. “It’s clear that there is no credible guidance for the residents of my neighbourhood beyond ‘good luck,’” he said. “In Middletown, they are now discussing with apparently straight faces how to deal with 450 paediatric trauma cases in the event of a leak near Glenwood Elementary. Some argue that the pipeline may never have been fully greenlighted if additional funds hadn’t been spent to woo support. According to public data collected by the watchdog group Marcellus Money, between 2007 and the third quarter of 2016, Sunoco Logistics spent about $654,000 on lobbying in Pennsylvania, placing it in the middle among 44 companies studied. At number one was the Marcellus Shale Coalition, which spent more than $18 million on lobbying. Sunoco Logistics is on the coalition’s board. If fracking comes to Scotland, inevitably so will pipelines. They may not be as large or as long as the Mariner East’s, and regulations and property laws differ from those in the US. But there will be risks. Ineos prefers to focus on projected economic benefits. An unnamed company spokesperson said that it was “not appropriate for us to comment” on their supplier, Sunoco Logistics. Whatever happens next, US campaigners warn Scotland to remain vigilant. When Sunoco first visited her community, psychologist Allison Chabot recalled that everyone was frightened, and everyone believed that the company would take their their land, no matter what. Ellen and Elise Gerhart, still maintaining their encampment, appeal to Scots to support their cause. “What Pennsylvania really needs from the people of Scotland is solidarity,” Elise told The Ferret. Miranda C Spencer is a freelance journalist based in New Jersey who formerly reported on fracking for a western Pennsylvania energy news outlet. This is part two of a major investigation funded by the digital campaign group, 38 Degrees, under a memorandum of understand giving The Ferret full editorial control. Part one is here. Videos thanks to Terrence Daniels, Robert Brulle, and Miranda C Spencer. Photos thanks to Robert Brulle and Elise Gerhart. On 11 July 2017 the name of the spokesperson for Ineos was removed from this story at the person’s request.